Taking quality photos of your kids playing sport does not have to be difficult. With the right tools and knowledge, you can capture some great images that will amaze your family and friends. We all love watching our kids play sport and there is no reason why you can’t catch the action on camera. Some may find it daunting trying to get that perfect photo of their child hitting that winning run or kicking a goal, but with a little knowledge and the right equipment you can come away with some fantastic shots that can be looked back on with pride many years later. Most digital cameras, including smaller point-and-shoots, will have a “sports” mode that you simply select for action photos. For truly professional-looking shots, a digital SLR is a must because of its ability to use longer lenses and better manual settings. Use a long lense: Sporting action doesn’t always happen right in front of you, so it’s important to have a lense that enables you to zoom in on the action. There is a wide range available, but as a general rule you will want one that has at least a 300mm zoom. For the absolute best, go to a 400mm zoom lense – they are the ones you see all the professional photographers use at major sporting events. Lenses of this size can be costly and bulky, but the end result is impressive. Action photography needs a fast aperture and these bigger lenses enable this. They also boast a more stable autofocus, eliminating a lot of the blurred images you get from smaller lenses. Make sure you get the right lense for your model camera as well. Continuous shooting: By default most cameras are set to single shot, but when taking sporting photos you want to fire away as much as possible to get the best action. Familiarise yourself with your camera’s options and find the continuous shooting mode. You will be amazed how you can get an awesome sequence of action. And don’t be afraid to keep shooting either – you can always delete those that haven’t worked later. Anticipation: One of the keys to getting great sporting shots is to anticipate where the action is going to be next, rather than where it is now. For example, if you are taking pictures of your child bowling a ball in cricket, aim your camera where they are going to release the ball and start shooting as they approach. If it is football, aim your camera where the ball is going next. It may take a little getting used to at first, but by anticipating the action you will get a better quality photo and will never regret missing that magic moment. Don’t be afraid to use manual focus: Auto focus is quick, easy and gets great results in most situations but sometimes in sport the action is so fast that the camera can’t keep up, particularly if using a smaller zoom lense. If you find that a lot of your photos are coming out blurry, find the switch that changes the focus to manual (it is usually found on or near the camera lense) and focus on a particular spot where the action is about to be. One of the most common complaints about sports photography is a pin-sharp background and out-of-focus subject. Using the manual focus can often eliminate this. Use the sports setting: It may sound obvious but using the correct setting will make a big difference to the quality of your images. Action photography demands a fast aperture, which means less blur, and the sport setting such as the one found on Canon cameras produces some striking images and take a lot of the guess work out of picking the right combination manually. Of course, those with a more advanced photographic knowledge can always experiment with different aperture settings. Use a tripod: Mounting your camera on a tripod or bipod is always a good idea. Firstly, it helps keep the camera still as movement when shooting fast can blur an image. The camera can also start to get heavy after a while, particularly when using a telephoto lense, and the tripod will help bear the weight. A good tip when buying a tripod is to make sure you consider one that is adjustable to your standing height as this is the position from which you will get the best pictures. About Author: Author Bio: Tom Mallet is an Australian freelance writer, journalist and Canon cameras crazy . He writes extensively in Australia, Canada, Europe, and the US. 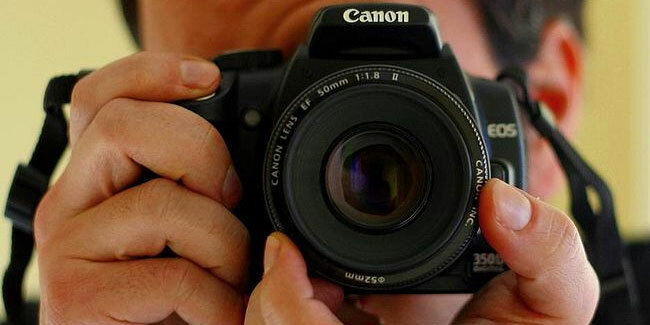 He’s published more than 500 articles about various topics, including digital cameras.